The buss word vibrating in town is “waste management”. There is enough stench in the air for public to feel something is not right. This reminds us of the adage “comments are free but facts are sacred”. The public make all sort of comments about why solid waste management practices in Sri Lanka are not effective and even some suggest how this issue could be resolved. All comments count for the debate. However, the real fact is that everyone is a part of the problem and everyone has a role to play in the solution. Until this is understood, nothing is going to work. The author believes that many either don’t have or don’t reveal proper understanding about the issue as well as the scientific and engineering basis of solid waste management. The author had spent 24 years in both Sri Lankan and overseas local government sectors and seen the good, the bad and the ugly nature of waste management processes. The author has no intention to exhume waste management skeletons buried in the Sri Lankan Local Government sector. What is baffling is that Government ministers and agency administrators announce action plans on a daily basis, suggesting that the solutions only scratch the surface of the problem. They aim at appeasing the public in the short term. It seems that they move in different directions as well. There is no wonder that the public and the affected parties are bewildered to believe who and what. To control this media circus, the Government must appoint a single agency spokesperson to announce proposed Government action plans and direct public feedback to that agency. This article is an attempt to describe who the stakeholders of the waste crisis are and what their roles should be. It includes technological options available to address the issue and also an example of a domestic waste collection process practised in Australia, although Sri Lanka is yet to be ready to adopt that option. Let’s face the reality first. The catastrophic failure of Meethotamulla garbage dump has awakened both the subjects and the rulers. The damage has already happened. The Local Government authorities are now busy with controlling the effect of the damage while trying to secure own survival. The Government has wasted enough money on investigating the Meethotamulla garbage dump failure. As a renowned scientist from the National Building Research Organisation (NBRO) mentioned the failure was not a landslide, but a ‘lateral movement of the garbage dump on the peat layer below’. As a former NBRO engineer, the author concurs with this assessment. The Meethotamulla garbage dump is not an ‘engineered sanitary landfill’. It had not been designed and constructed that way. Hence, the structural failure of the freely-stacked garbage mound was inevitable. Hence, there is no need to turn money also into waste to teach what the public already knows. The Government has two responsibilities to fulfil as a response to the disaster. The short-term action is to use the limited funds available to relocate residents living nearby the garbage dump to safer locations. As a long-term action, the garbage mound must be removed. If the garbage mound is left there, the groundwater contamination due to the dispersion of “leachate” would be continued and the methane emission, polluting clean air, would go on for decades. Having said that, what should the authorities do next to resolve waste collection and disposal issue? It is a two-step process. First, the problem must be analysed and the scientific and engineering basis of waste management must be understood. Thereafter, the practical and sustainable options/solutions must be taken accordingly. There was a news item last year October that “as of 1 November 2016, Municipal Councils around the country will refrain from collecting household garbage if it is not sorted”. The author wrote an article to the Institution of Engineers newsletter on this and predicted this would not work and the long-term reaction from the residents would be the disposal of garbage at the nearest unauthorised dumping point, if the authorities refuse to collect non-sorted garbage. Also the author warned that if this happens, seriousness of social health impacts would outweigh the burden of collecting non-sorted garbage. As predicted, it happened. Minister Champika Ranawaka recently attributed this situation to the behaviour of low income families within Colombo and also of high income people travelling to the city who bring home garbage in vehicles. However, the fact is that when there is no proper waste management system in place, people react rather than respond. Unfortunately, this reaction has no economic or social bounds. In general terms, waste is a residual product generated from the consumer products and materials after economic use. The common perception is that waste is of no “value”. In Australia, waste is considered as “a resource at the wrong place at the wrong time”. With that positive perception in mind, Australian authorities handle solid waste to extract the value hidden in waste. Wastes can be categorised based on many characteristics. Most common classifications are attributed to the treatment options, the physical state, the original use, the physical properties, the material type, the source, and the safety level of the waste stock. Generally international environmental agencies use a combination of the above classifications, while keeping the environmental compliance as the primary focus. In NSW, Australia, the classes of waste are defined in Clause 49 of the Schedule 1 of the Protection of the Environment Operations Act 1997. It includes special waste, liquid waste, hazardous waste, restricted solid waste, general solid waste (putrescible) and general solid waste (non-putrescible). The author could not find a Sri Lankan Government document outlining a “waste classification system” for Sri Lanka, specifying environmental compliance requirements for each waste category. The lifestyle of Sri Lankans is increasingly becoming that of the developed country residents thanks to the continual influx of foreign products and busy lifestyles. Hence, it is better to research on international waste classification systems and then adopt one for Sri Lanka, if a classification system is yet to be developed. Sri Lanka is at a critical stage that the application of Alternative Waste Management Technologies (AWMT) would be inevitable to resolve solid waste management issues. Sri Lankan Government has openly expressed the interest on foreign technical solutions. International companies would be keen to introduce such industries to the Sri Lankan business environment. If the Sri Lankan environmental regulations for waste management are not in line with the international standards, the overseas companies would no doubt take the undue advantage to increase economic viability of their business operations at the expense of our pristine environment. So, robust environmental regulations on waste management must be developed now without any delay. Until the late ’90s, developed countries had a popular waste destination called ‘engineered sanitary landfill sites’. However, in 1999, the European Commission issued the directive 1999/31/EC, thus, banning disposal of putrescible waste into “sanitary landfills”. In addition, governments tightened environmental regulations on allowed waste disposal in landfills. Hence, operation of a sanitary landfill facility became a costly business even to the local authorities who general spend rate payer funds lavishly. This situation led waste management authorities to find alternative solutions. In Sri Lanka, unfortunately, the attention to the alternative waste technologies eventually required a cataclysmic disaster, costing lives. The commissioning and operating of AWMTs require a significant amount of funds. If the private sector companies run these industries, the initial high establishment costs will prompt the business owners to seek long-term business contracts with feedstock suppliers to ensure their businesses are economically viable for the planned operational time span. Hence, Government intervention and assistance is essential. Private sector business ventures rely on the continuous, on-time supply of high quality and quantity waste materials. As of now, the municipal waste collections in Sri Lanka are managed by the Local Government authorities. As the management practices of Local Government are rigid, this is a risky business for the private investors. To overcome this barrier, the establishment of an efficient Waste Management Authority is highly recommended. By nature, the waste feed stocks are scattered across districts and provinces, making it costly to collect and transport to a central location. Often the feed stocks are not homogenous, resulting in poor quality end products from the waste treatment process. Hence, the local collection and sorting processes of waste material need to be carefully organised to make these processes efficient and effective. When AWMT businesses are established, environmental activists would make a huge cry citing environmental concerns. This should be predicted, due to the unknown nature of the technologies. Hence, the scientific and the engineering community have a professional obligation to treat the facts fairly and at the same time quash unscientific propaganda from politicians or rival competitors through a lively dialogue with the community. Processing technologies: Waste materials can be treated using three main processing technologies, thermal, biochemical and chemical. In the thermal processing, waste is subjected to high temperature. The underlying activities during this process include combustion, gasification and pyrolysis. The outputs from this process would be the heat, power and also chemical feedstocks. Biochemical processing involves the anaerobic digestion of waste and the waste material is confined to an environment of less oxygen to allow digestion. The outputs of this process would be chemical feedstocks such as disintegrated waste enriched with nutrients which can be used as fertiliser. When waste is subjected to chemical processing, the chemical reactions such as fermentation and esterification would take place. The output products of this process would be ethanol and biodiesel. Landfill technologies: Engineered sanitary landfills are the most common waste disposal method. Methane capture for energy production is the main technological application for a landfill. Methane would be generated inside a landfill for 15-20 years. Methane production is dependent on anaerobic conditions. Hence, the waste landfill must be properly designed and enclosed using geo-textile membranes to form airtight waste cells to promote anaerobic condition. Waste separation: Waste separation allows further treatment of separated waste. However, the ease and efficiency of waste separation depends on the collection system and the extent of the contamination at source. Material Recovery Facilities (MRFs) have a combination of automated and manual waste sorting methods. Some separated waste varieties such as metals, glass, and plastics can be recycled to produce similar products. However, different colour glass cannot be recycled together and any cross contamination would cause recycling ineffective. Biological treatments: Organic waste can be subjected to biological treatments by facilitating microbial activity. Open windrow composting uses decomposition of organic materials by microbial activity under open aerobic conditions. This process will produce organic material containing plant nutrients. Quality of organic material produced would depend on the extent of the contamination of the feedstock, the degree of aeration, the moisture content and the temperature. Composting: Enclosed composting is the composting under controlled conditions. As aeration, moisture condition and temperature are artificially controlled, the resultant organic produce is of high quality. Vermicomposting process requires, introduction of worms to encourage consumption of organic waste to produce high quality compost. Bacterial degradation of organic material in the absence of oxygen is termed as anaerobic digestion, would produce high quality soil condition enriched with nutrients. The by-product of this process is methane which can be used for energy production. This process is done in digester tanks with proper controls in place for pH and temperature. Fermentation technology: In this technology, organic wastes such as agricultural, food, sewage sludge and bio-solids are biologically degraded to produce liquid fuel such as ethanol. Waste management actions are hierarchical. It is in this order: ‘Avoid, Reduce, Reuse, Recycle, Recover, Treatment and Disposal’. The most preferred action is the avoidance. The stakeholders must follow the hierarchical actions following the order, when dealing with waste. The management responsibility of waste should be a joint effort by the product designer, manufacturer, importer, user, residual product (waste) collector, waste processor and waste disposer. If any of the stakeholders behaves irresponsibly, the waste becomes a burden to not one but for all. All stakeholders must have a basic knowledge on alternative waste management technologies available in the world. Theoretically, the products that cannot be treated by the available technologies, should not be produced. If such production is essential, the production must be limited to manageable quantities as such products will end up in the landfills. The designer/manufacturer of the product: The designers should design the products such a way that environmental impact due to the products is minimal. Technically, it is the product designer who takes the first step to generate waste. The production of milk bottle would be a simple example to illustrate the rational thinking process. When the design is in progress, the designers should investigate on material options (metal, glass or plastic), material recyclability or degradability and the product packaging requirements, at the least. The product designers and distributors should be held responsible for environmental impacts due to their products. In the Western world, some product distributors have waste storage, recycling and disposal facilities for their residual products. A prime example is that the supermarkets have collection bins for used plastic shopping bags. Similarly, mobile phone retail outlets have collection bins for discarded mobile phones and lithium batteries. Some Western Government institutions adopt “return to the sender” policy by sending back the received documents to the sender (after keeping a digital copy). In Australia, a development project approval is not granted if the developer fails to submit a waste management plan with the application. In addition to this, government contractors have to report to the clients how waste would be managed. During the construction phase, how many tons of waste were recycled and sent to the landfill, must be reported. The contractor’s ability to minimise waste generation and manage waste environmentally friendly manner, is considered favourably to win contracts works. The product importer: In Sri Lanka, anyone can import any product without considering waste disposal options. In fact, the product importers should be responsible for every step of the product life cycle to a certain degree. The argument here is that the importer earns a profit by importing and selling a product. Then, the importer knowingly transfers the responsibility of managing undesirable product impacts to the user and the local government, knowing the effects from the products during the rest of the product life cycle. This is not a fair transaction. One can argue that user should take the responsibility but definitely it should not be the local authority. Government should make importers accountable for their products within its whole lifecycle (Production, Use and Disposal) as the current set-up only encourages irresponsible importation of products, without any consideration for the impact to the society or the environment. Importing used vehicles to Sri Lanka is a classic example of such. Some countries have imposed a ban on this. The product user: Before buying a product, the user also must think how to handle the waste generated from the product. If there is no pre-arrangement in place by the producer or the importer of the product to collect the residual product/waste, the responsibility of managing waste shifts to the buyer and user. Generally public incinerate or bury under the ground waste products. Before doing so, the product user must investigate whether incineration or the burying is the correct disposal method. Some may opt to leave waste products for the municipal authorities to collect of course, if the authorities are willing to collect and dispose such waste behalf of public. Rate payers mistakenly believe that if a municipal authority collects waste, it is a free of charge service. Basic economics prove that there are no such activities called “free of charge services”. The local authorities use tax or rate payer funds to handle waste. By doing so, authorities will forego the provision of another service as the resources are scarce. This opportunity cost will be a burden to rest of the community, without them understanding how it happened. The message is that unnecessary and avoidable service burdens should not be thrusted upon the public service organisations as it would cost all ratepayer equally in the long run. Hence, responsible products buying habits would benefit all, in the long run. The residual product (waste) collector: Traditionally Local Government authorities are responsible to collect and manage solid waste. However, this is a primitive concept. One should question why only a Local Government authority is responsible to collect a residual product, if the product was owned by someone else and also it was not produced by the authority, in the first place. Hence, it should, at least, be a joint responsibility of all to manage the product within its life cycle. Collection of waste is a massive and delicate operation. It involves resources planning, route planning and program management. The author personally knows that it is not being done as practised in developed countries. The analysis and commenting on waste collection planning process is outside the scope of this paper. However, a brief description of how Australian domestic waste collection is given in a latter section of this paper. The author has some reservations on practicality of adopting same method in Sri Lanka yet. Degradable and recyclable wastes are to be collected separately. All such collections can be carried out by a private sector organisation, a public sector entity or by a partnership of both. Collection and transportation of toxic waste must be done under strict guidelines for public safety reasons. In NSW, Australia, City Councils have special collection points for computers, printers, printer cartridges, paint containers, used lubricants etc. Such wastes are not allowed to be disposed into household waste bins. Further, only licensed contractors are allowed to handle asbestos waste. Residual product (waste) processor: Alternative waste management technologies can be applied to produce fertiliser from degradable organic waste. Recyclable waste can be sorted and treated using appropriate technologies to reproduce similar products. However, application of all these alternative waste management technologies depends on the availability of technologies, quality of waste, economic viability and the business operators’ ability to comply with environmental regulations. The Government should take a collaborative effort with private sector to implement a proper waste treatment strategy. There should be a monetary demand for recyclable wastes and re-treatable wastes. That demand will motivate public to bring recyclable or treatable waste to relevant waste collectors. To make these industries economically viable, Sri Lankan Government must offer tax concessions for plant and equipment imports and possibly through availability of crown land under long-term leases to set up industries. The fertiliser production using waste can only be viable if appropriate, uncontaminated waste is used. Otherwise, contaminated waste treatment processes would produce fertiliser with traces of toxic materials and heavy metals. If this fertiliser is used for agricultural industries, the produce would be unsuitable for human consumption. Incineration of waste is only economically viable if the waste has low moisture content. Waste processing includes dealing with the by-products as well. Methane gas generated in landfills can be extracted through a strategically placed piping and collection wells system. Methane can be used for energy production. Methane extraction offers in-direct advantages as well. Entrapped methane can cause instant spot fires emitting toxic by-products. Also, entrapped methane can even cause explosions. Methane usually absorbs into cloths/garments. This can result in unhealthy and unpleasant living conditions to nearby residents and landfill operators. Residual product (waste) disposer: The self-purification capability of the natural environment is long gone. Majority of modern waste products are no longer degradable or takes a long time do degrade and the quantities are no longer small enough to absorb into the natural soil. Further, the consumer market is flooded with pre-packed, ready to eat, food products which contain variety of chemicals. When these food wastes and toxic parts of plant and equipment are dumped together in or on ground, various chemical reactions would take place producing toxic chemicals. If toxic materials enter into a food chain, there would be an adverse health implication to living beings. Even an ideal waste management strategy is followed, there will be a quantity of residual waste which should be disposed at landfills. Sanitary landfills are engineering structures designed and built according to engineering and environmental standards. Hence, the landfills must be designed, constructed and operated by engineers and must be periodically monitored by environmental compliance specialists. The selected site must be especially pre-prepared to receive waste. The site can be a flat ground or a valley. Both options have their own pros and cons. The important aspect is that the waste should not physically touch the ground and the gaseous products generated from waste should not enter to atmosphere at excessive levels. The separation is done by placing waterproof geo-textile material. Leachate liquid and methane gas collection piping systems and extraction wells would be placed progressively while waste deposition is in progress. Methane and leachate extraction pump systems are also to be installed. Methane processing plants are to be built to harness energy. Each waste layer is compacted and covered with a soil layer to create anaerobic condition inside the landfill. Also, the buffer zone of the waste landfill should have a series of test pits to periodically check the ground water quality. Metering stations are to be set up to detect methane emission levels which should not be above acceptable levels. In NSW, Australia, late ’90s, there was a major drive to reduce garbage sent to landfills by 60%. Regional Waste Boards were set up under the NSW Waste Minimisation Act 1995 and local councils received funding and staff to implement “sorting of garbage at the source” actions. This Act was replaced later with Waste Avoidance and Resource Recovery Act 2001. In 2003, a new strategy was introduced and the targets were revised for municipal, commercial and construction to 66%, 63% and 76% respectively. This strategy was further revised in 2007, 2010 and 2011. This proves that the developed countries are continually serious about waste avoidance and recycling. 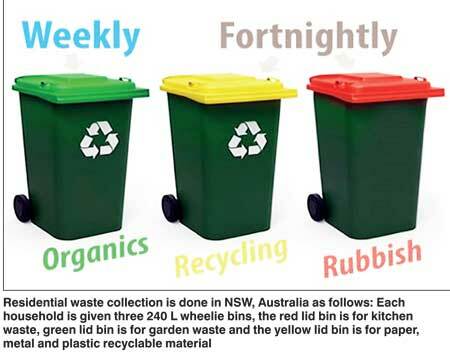 Let’s look at how residential waste collection is done in NSW, Australia. Each household is given three 240 L wheelie bins. Red lid bin is for kitchen waste. Green lid bin is for garden waste and the yellow lid bin is for paper, metal and plastic recyclable material. Red bin is collected weekly and the other two bins are collected fortnightly, alternative basis. The collection happens early morning on a specified weekday. The resident has to leave the bins at kerb side on previous night, with the lid opening side facing the road. The bin is emptied mechanically into a compressor waste truck by the driver by activating a ‘grab, lift and empty’ mechanism. If a resident forgets to place the bin or places it in the wrong direction, the resident has to wait for another week to get the correctly placed bin collected. The garbage trucks have GPS tracking systems installed to minimise false compliant on non-arrival of trucks. In addition, the city councils offer each resident twice a year major recycled material disposal opportunities, on request. Also, there are a few bulk electronic and toxic waste disposal days for residents. A special levy is added to council rates for waste services and the service is carried out so efficiently. There are special investigators who check bins randomly whether the correct garbage is in respective bins. If wrong garbage is inside, there will be a sticker on the bin, advising the truck driver to not to collect the bin. If anyone disposed garbage or hazardous waste illegally at a public place, special investigators work on identifying culprits to take legal action. Adopting of foreign practices: To adopt a successful foreign waste collection process, the local ground conditions of the host country must be conducive. Given the current economic conditions, the level of infrastructure development, the degree of law and order enforcement and the public discipline, Sri Lanka is not yet ready for adopting fully sophisticated mechanised waste collection service. At present, there is no unobstructed clear space at public road side even to place bins. ‘Would a bin survive overnight without getting stolen/damaged?’ is another matter. Decades ago, even the metal skip bins belonging to Colombo Municipal Council were gradually destroyed by setting garbage on fire. Public discipline: A society cannot be disciplined by force. It should be done concurrently through education and setting rules and regulations. It should be critically investigated that why the society behave undisciplined manner. The author has a simplified explanation that could be a catalyst for another discussion. When the majority of society is economically poor, discipline goes down in their priority behavioural list and more priority is given to economic survival. In addition, the rich and the powerful sections of the society also behave unruly manner just because they could do anything and get away due their status within the society. The people in the middle layer tend to think “why not us?” and start behaving in the same manner. This is the dilemma Sri Lanka is currently facing. Disorderliness has become a part and parcel of the social fabric. To restore public discipline, a country must be economically prosperous first. Every citizen must be educated on their civic roles from ta he tender age. The author wishes that all political party representatives get together and develop a national scheme to educate all kids how to behave in society. To do that, politicians must be role models first. That is a massive ask. If this becomes reality one day, then, this scheme can be implemented by social leaders and educators as children would trust the message coming from well-respected independent civic leaders. School children also can influence their parents as well to behave as role models in the society. When the country and the ground conditions are ready, engineers can seek foreign assistance to obtain resources such as highly-mechanised trucks and funds for building waste transfer stations, waste transportation systems and engineered sanitary landfills. Until such time, a well-functioning manual waste collection process should be in place. Resources for mechanising the operation should only be sought after that. Sri Lankan engineering and scientific community must work together to develop a sound Waste Management Strategy with a scientific and engineering base. Politicians must support this effort by setting up of policies and legislative instruments. The author suggests that there should be an independent Sri Lankan Waste Management Authority headed by a competent professional civil engineer as the Director General (DG). The DG must be supported by a director board of competent geotechnical, chemical, mechanical, electrical and environmental engineers. It is recommended to have a sociologist, and an economist on board as advisers for strategic decision making. The primary purpose of this authority is the development of a Waste Management Strategy for Sri Lanka and an Action Plan for all local government authorities to follow. Provincial Sanitary Waste Management Landfills and District Waste Transfer Stations are to be set up and regulated by this authority. Operations of Material Recovery and Recycling Plants must also be regulated by this authority. This agency should conduct community awareness programs on best practice waste management practices and promote private and public partnerships on recycling waste.